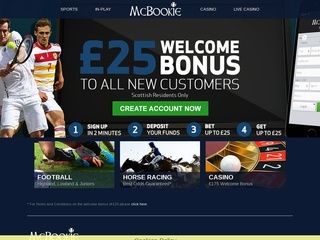 Mcbookie is one of the oldest Scottish bookmakers in the world founded in early 1961. As the name suggest, the bookie is dedicated very much to the Scottish players and tries to be the leading betting platform in Scotland. The company that owns the site is McBookie Ltd, which took over from the previous owners in 2009. The platform is operated by the famous BetVictor Ltd The site itself has been online since 2003 and proved to be one of the most patriotic bookmakers that always put Scottish sports and punters before everything. Despite their long history, the bookmaker hasn’t been that popular outside Scotland, and it’s not very common for foreign players to join their site. The company is registered and operates under the jurisdiction of Gibraltar. It’s very common for UK betting platforms to register their businesses there. It’s licensed by the Gambling Commission in the UK. Of course, there are many nonscottish players that enjoy the platform. Recently they became the sponsors of The North Region Junior FA, and they were also sponsors of the McLeman Cup. With their great betting markets and excellent odds owners of the site try their best to rank it amongst the bigger names in the industry. Once you enter the site, the Scottish influence will be evident from the start. The platform itself is pretty simple with all the menus on top, and the interface is nice and intuitive. There you can find Sports, Casino, In-pay, Live Casino and their Blog. Seeing a blog on a betting platform is not very common but they’ve put the effort to keep it updated with scores, news, and previews. As far as the sports go all you need is happening on the left side of the screen where you can find all the markets for sporting events. Football, Golf and Horse Racing are rated as the top sports which is pretty self-explanatory as they’re one of most popular sports in Scotland. In the Football menu, you can find a dedicated section for Scottish Football. Some interesting sports as Hurling and Gaelic football are also available for their fans. As far as the Casino goes, it’s pretty stacked with all sorts of games. All types of roulettes, black jack, slots, and poker are available. The Live Casino is organized as three separate clubs where you can find from 10 to 25 tables for Black Jack, Baccarat, Hold’em Poker and three card poker. There are wagers for Politics and entertainment events (as the Oscars). For users who like to bet on the go, Mcbookie has provided a very light mobile platform. They also offer a dedicated app for Android and IOS mobile devices. The bookmaker is very proud of the new Cash Out option provided and explains how it works in their dedicated Blog article. Odd formats provided by the site are plenty that gives away their intention to satisfy their international public. The UK odd format is self-explanatory (as a Scottish site) but there are also, European, American, Chinese and Indo. The markets for bets are well done and you’ll find your favorite wager fast. Football is the king here with over 80 bets available for a single event. You have a Correct Score, Both teams to score, 1st half result, Draw no bet, Double chance and many more special wagers available. Asian handicap is missing, but you have the option of 3-way handicap. For horse racing, you have all the major tracks from France, Scotland, England and even South Africa at your disposal. American football is also available with Money Lines, Total Points Over/under and Handicaps. Mcbookie has had some problem with customer service in their history, but the owners have made their best to solve them. The lack of an SSL encryption on their main site is still surprising, but they do have it on their mobile version. The live chat option ensures customers that they’ll have an answer to their problems right away. And yes, they do have 24/7 customer support unit that works 365 days of the year to make sure the players needs are met swiftly. Another option to contact the support is through their email or via Facebook and Twitter. The included blog articles give very valuable information about recent changes on the platform and frequently asked questions. The search function is helpful, and you can easily find what you are looking for without much hassle. The site is part of the Responsible Gaming movement where bookmakers encourage players to bet for fun and not make it a habit. It’s very easy to deposit money into your Macbookie account having the option to choose from plenty of deposit methods. You can even deposit through your phone using your Debit and Credit card. The minimum deposit amount is $10 and the maximum $8000. The currencies in which you can deposit money are plenty with over 15 currencies available. To withdraw money from your account, you can use the method you’ve deposited them. Waiting times for withdrawal of funds depend on the withdrawal method. Minimum withdrawal sum is $5 (or currency equivalent), and the maximum is $10,000. Mcbookie, as a self-respected bookmaker, provides a very generous up to £25 sign-up bonus for new players. The rollover requirement is to bet the funds on odds of 2.00 or greater and after you have staked them four times. There is also the Coupon Buster offer where you can get a refund for up to £25 if one team lets you down on your coupon.